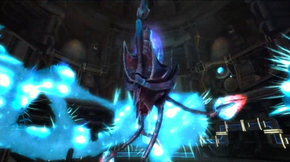 Metroid Hatchers are Phazon-mutated Metroids that appear as mini bosses in Metroid Prime 3: Corruption. There are three of these in the game, but the one on Norion is optional. Samus can encounter the one on Norion once she is equipped with the Plasma Beam. Their appearance is similar to that of a floating head with four tentacles hanging down. Its main form of attack is to use its tentacles to strike a foe, but if forced to retract its tentacles, it will spawn Phazon Metroids and try to collide with the foe. At this time, its inner mouth is vulnerable to attack. If the mouth is damaged enough, the tenatcles can be ripped off. If all tentacles are ripped away, The Metroid Hatcher will explode. Alternatively, using the Nova Beam with the X-Ray Visor will kill it in one shot. Metroid Hatchers are also very easily defeated with Samus's Screw Attack. The Screw Attack easily stuns the creatures' tentacles and can also rip through their spawned Phazon Metroids. Metroid Hatchers are one of few bosses that are fought multiple times as boss battles. Mutation has robbed the Metroid Hatcher of its ability to phase, but has provided it a hardened outer shell which has identical attributes as Phazite. This shell protects the creature's heart, located at the core of its head. The Hatcher's tentacles are quite dangerous, and can even leech energy from any targets they connect to. However, the tentacles are also the creature's weak point. If all its tentacles are ripped from its body, it will perish. As such, it will attempt to recover energy by retracting them into its shell when they take damage. While the Hatcher's tentacles are retracted, it is unable to attack, relying on the Phazon Metroids it spawns from its mouth for protection. If the interior of the creature is hit while its mouth is open, it loses its strength. The Hatcher's tentacles can be ripped off if they are pulled at this time. This page was last edited on 18 July 2013, at 03:56.